N Biren Singh meets general people. Manipur Chief Minister N Biren Singh attended to around 600 complaints and met nearly 1500 people in the day’s ‘Meeyamgi Numit’ (People’s Day) from 9 am to 1 pm on Sunday. N Biren Singh has been meeting general people to attend to their complaints and grievances on two occasions – ‘Meeyamgi Numit’ (on 15th of every month) and ‘Hill Leaders’ Day’ (on 10th of every month) since May last year. Sunday being the ‘Meeyamgi Numit’, hundreds of people turned up to highlight their grievances to the Chief Minister at his official bunglow in Imphal. The Directorate of Information and Public Relations organised public screening of film/documentaries highlighting the achievements and new developments in the State. Officials of Health Department and JNIMS hospital had been deputed at CM’s Secretariat for the day to attend to the people, who seek medical assistance, reimbursement and health care in government medical hospitals. Other departments including Minority and Other Backward Classes, Social Welfare and Police departments were also deputed at the Chief Minister’s Secretariat to help attend to the grievances of the public. Besides, the Chief Minister’s Secretariat also made elaborate arrangements for the convenience of the general public. Light refreshments including water, tea and snacks were provided to the visitors. A medical team along with an ambulance and a team of Manipur Fire Service were kept on stand-by at the complex for any emergency. 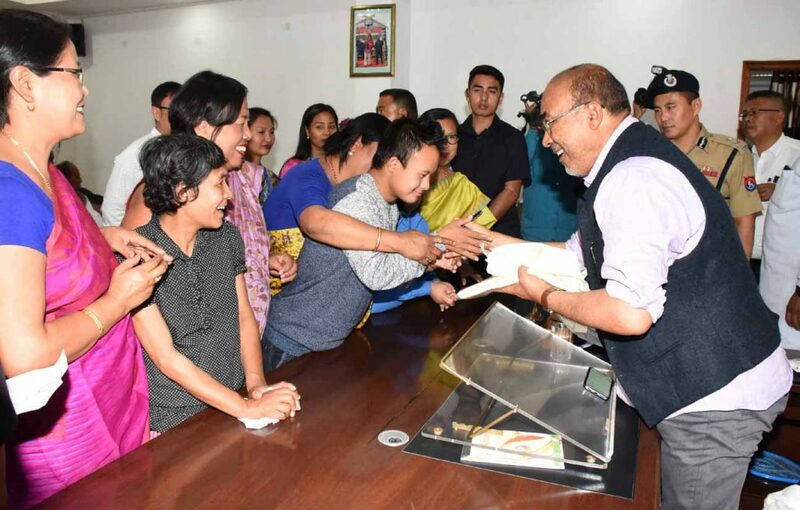 Teachers and students of BB Paul Mental Development Home (Special School), Mongshangei located on the outskirts of Imphal, also met Chief Minister Biren and expressed their happiness over the Cabinet’s decision for converting the school into a government aided institute. According to Principal of the BB Paul Mental Development Home (Special School), T Anita Devi, the institute has been imparting vocational training and co-curricular activities including carpentry, tailoring, yoga, dance and music, etc. to 175 special students.